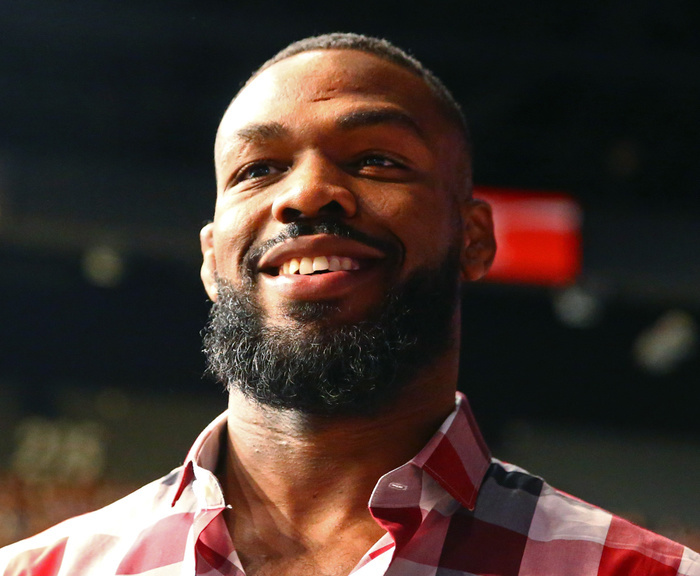 Former UFC light heavyweight champion Jon Jones tapped out former two-division Pride FC champion Dan Henderson via an arm triangle at the 6.39 mark in their grappling contest on Sunday night. Jones and Henderson were originally set to meet at UFC 151 back in 2012. However, those plans were scuppered when Henderson pulled out of the fight with injury. The event was then pulled altogether when Jones flatly refused to entertain the thought of taking on a replacement opponent—a decision which landed him in hot water with the UFC brass for a considerable amount of time. Because of the pair’s backstory, Chael Sonnen’s announcement that Jones would be finally taking on Henderson certainly attracted plenty of interest—even if this was a contest under the Eddie Bravo Invitational ruleset rather than under the guise of the UFC. The main event of Submission Underground 2, which took place at the Roseland Theater in Portland, Oregon, started quickly with Jones pushing Henderson to the cage. The pair exchanged pleasantries via a faked Hendo H-Bomb and Jones retaliated with a mock spinning elbow in return. Realising he is unlikely to get any change from a former Olympic-level Greco Roman wrestler against the cage, Jones soon reset. After a period of time waiting on his back, trying to tempt Henderson into his guard to no avail, Jones soon managed to get a hold of Henderson where and how he wanted him. Jones, who had a 31lbs weight advantage over Henderson, managed to quickly get “Hendo” down to the yellow mat with a slick superduck straight into side control. From then on, Jones was in total control. Continually probing the submission and ground defence of Henderson’s—transitioning from side control, to north-south position and back again. Eventually, Jones settled on the full mount position. From there, Jones easily managed to secure an arm triangle choke from the mount, before shifting his body back to the side control position mid-choke to gain complete leverage. Jones comfortably won this contest with Henderson offering very little in terms of offence nor defence, truth be told. In a rematch of sorts, following their fight in the UFC back in 2015, it took overtime to determine the winner between Miesha Tate and Jessica Eye. Like under MMA rules over a year ago, Tate was the victor on Sunday night, though not without controversy. After a failed takedown from double overhooks, Tate managed to secure an armbar in the ensuing scramble. With Eye’s arm extended, the match official inexplicably stopped the contest despite Eye not having tapped. In a further blunder, the official restarted the contest on the feet despite his initial error costing Tate her advanced position on the mat. Tate controlled the contest from there, taking Eye down in spite of the referee’s actions, but was unable to capitalize on her position to prevent the bout from going to overtime. After some back-and-forth action in all three overtime segments, Tate eventually won the contest via escape time. However, Eye put up a great fight, almost securing a dramatic armbar with seconds left in the final stanza. Could this taste of competitive action have Tate contemplating her decision to retire following defeat to Raquel Pennington last month at UFC 205? Another one of MMA’s most intriguing characters, Jeff “The Snowman” Monson, appeared on Submission Underground 2. In the past, Monson has enjoyed weight advantages over many of his opponents during his esteemed grappling career, appearing in the absolute division. His loss to the much-smaller Gunnar Nelson springs to mind. But, this time around, the multiple-time ADCC and FILA Grappling World Champion was at a weight disadvantage—by a whopping 70lbs against the larger Warren Brooks. Monson took inspiration from Nelson in his performance, securing a rear-naked choke on the bigger man in the first frame of overtime. Brooks had to submit Monson to level the scores and opted to try and take the arm of The Snowman. However, in a matter of seconds, Monson smartly escaped to earn the victory.